Is the Legault Popularity can be the result of an astroturf campaign. It does seem to have possible astroturf roots. Therre's little else to explain why this party suddenly just happens to have over 30% support in the polls. I wonder if Bouchard is playing some secret role behind the scenes. His whole agenda since the Nineties has been to turn sovereigntism into a right-of-centre big business movement-kind of a Quebec equivalent of Ireland's Fianna Fail party(especially as that party existed in the Bertie Ahern "Celtic Tiger" era). There's certainly no logical reason for a party that claims to be sovereigntist but also "pro-business" and, presumably, pro-austerity, to be climbing in the polls in QC. Perhaps "Les Freres De Koch" have found some way to start working north of the border. I predict that, if this party does make a breakthrough, it will come closer to being the second coming of the Union Nacionale than any other Quebec party ever could. They've released the logo for the new party! They've released the logo for the new party! They've released the logo for the new party! OK...the logo is a letter "c" that's stopped taking its medication. Brilliant. It's a half-eaten rainbow parfait ring! 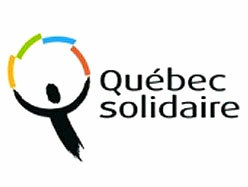 ...I think that logo has more distinct colours in it than the logos of every other political party to ever exist in Quebec do--put together. say the name (the abreviation)four or five time in a row and do it quickly. Don't worry, it a running gag in quebec!